First, the quality of the jacket seems to good. It’s a heavier jacket, with good lining and pockets (although one pocket was stitched improperly). I can’t say much more to the actual quality since I ended up returning it. The jacket is not “wrinkly” at all. 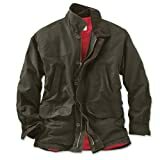 It is a very firm material that does not drape well, the hand warmer pockets in the middle of the jacket make it look very bulky. It is not “stylish” to say the least. Take the jacket in the picture and take it the dry-cleaner and ask for very heavy starch and you’d end up with a better idea of what it actually looks like. If you still decide to get this jacket, I’d recommend going a full size down. I’m 6ft ~170lbs and the medium was way too big. Note that this order is through Orvis, so any returns you will pay for return shipping and it’s not quite as easy/straight forward as Amazon returns. Great product for working or playing in the cold! Fits perfectly, love the rugged look. For colder weather, you may need a sweater. Cuts the wind and love the pockets they are very convenient. Did not find the coat “too stiff” Wish it came in a few other colors so I could buy another!!!! This coat should last for years. A throwback to the 60’s and 70’s….but what a great throwback. Fits perfectly, rugged look. For cold weather, you will need a sweater or fleece top, but cuts out the wind. Pockets are very convenient for your hands. Someone complained in the reviews that it was too stiff — all you need to do is wear it in a good rain once and it looks just like the picture. It’s canvass, but soft and pliable. I researched probably 6-7 sites before selecting Orvis — glad that I did. This coat will last for years.